South Korea 2014 from Milet Miranda on Vimeo. Special thanks to my friends Jett and Maki. To our cab driver/tour guide in Jeju Island, Mr. Kang. To the owners and staff of Vestin Residence in Myeongdong and Hotel Four Seasons in Jeju. 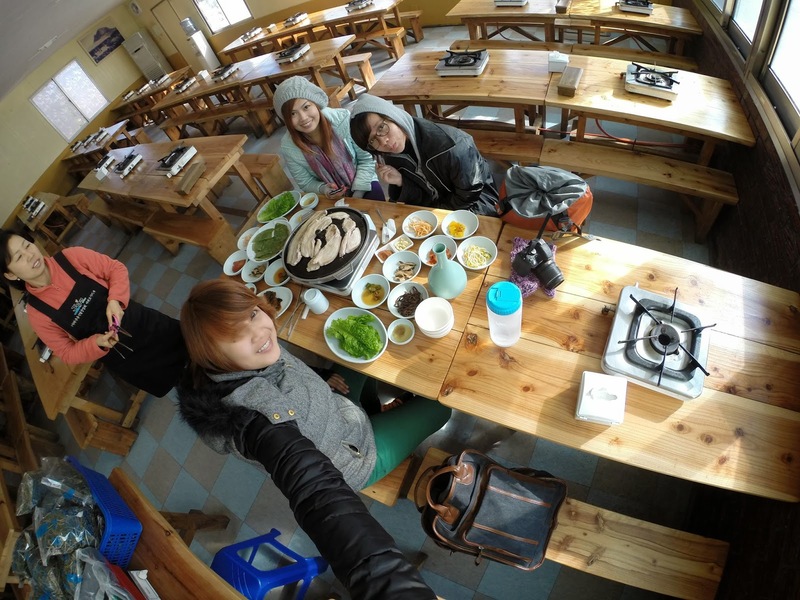 To our tour guide in Nami Island and Elysian Gangchon Ski Resort. To the random Korean people we met in subway stations, bus stations, BBQ boys, Ahjummas in Korean BBQ restaurant. Gomapseumnida! We flew from Seoul to Jeju on our second day in South Korea. Upon arrival in our hotel, we immediately ask the receptionist to contact a cab driver to take us around Jeju. Since we did not have enough time for breakfast, we were looking forward for our lunch. 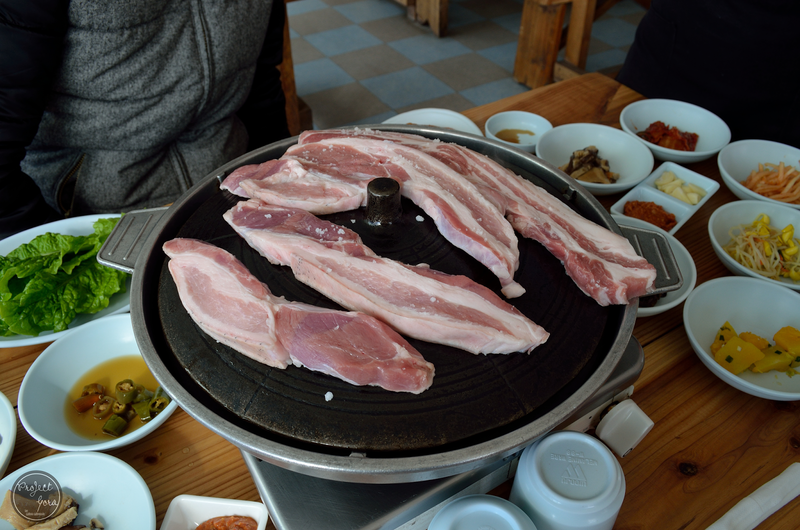 We told Mr. Kang, our cab driver/tour guide, we wanted to try the famous black pig barbecue and Makgeolli that we always see in Korean Dramas. 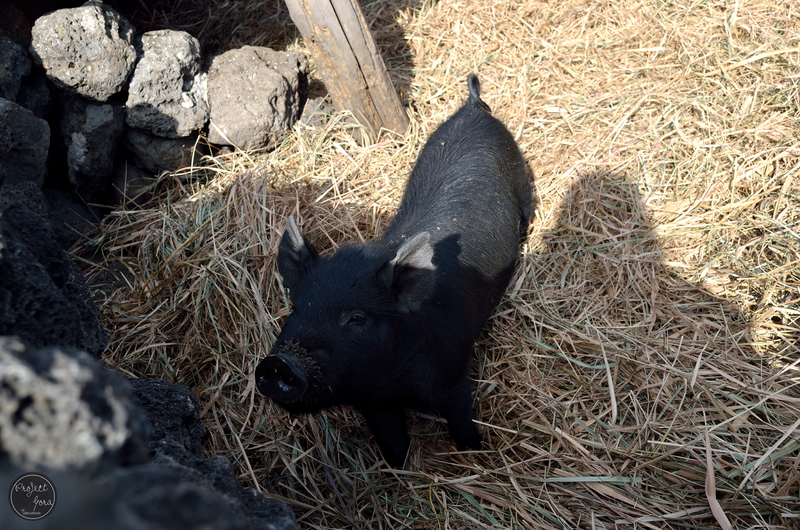 I notice that the actual flesh of black pig is the same as the usual pig. The only difference is that the hair is black. It's funny though. 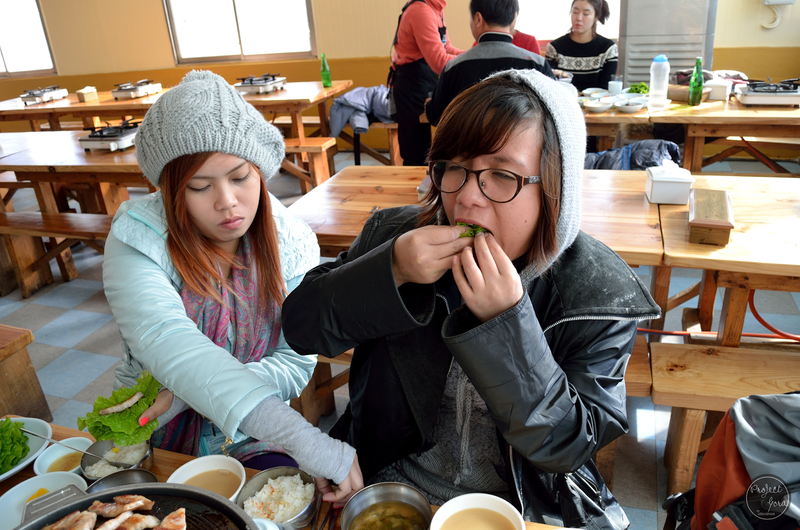 When we started eating, the ahjumma went over to our table and told us we were eating it the wrong way. She actually did not tell us, but she did some hand signals and we sort of understand. Mr. Kang went to our table as well and he taught us the proper way of eating. 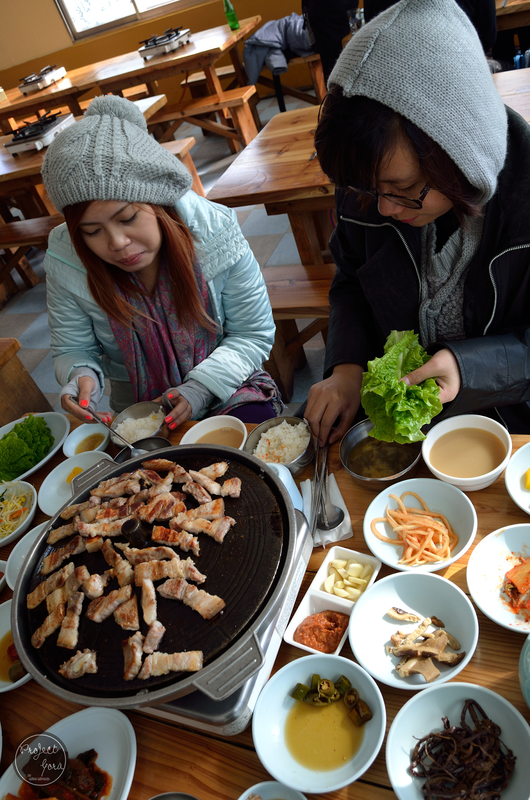 I did not know there is a korean barbeque do's and dont's! How to eat Black Pig BBQ/Korean BBQ? Simple. Get a piece of lettuce and wrap around the freshly grilled meat. Add bean paste and grilled garlic. Make a bite size sandwich. I don't recommend 2 lettuce leaves because the size gets bigger and it would be hard to chew. The meat was really good! It was tender with a really yummy taste though it was not marinated prior to cooking. It certainly does not have the oily and porky taste that is commonly found in ordinary pork meat. 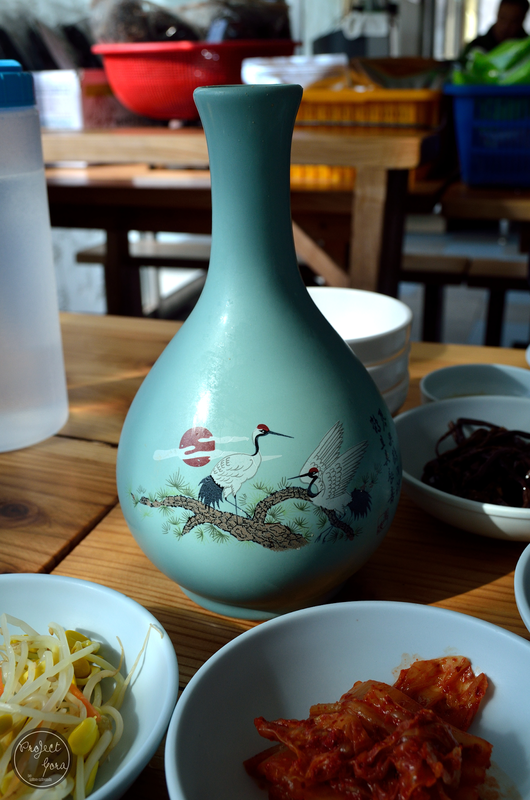 The korean restaurant we went to did not fail our expectations. 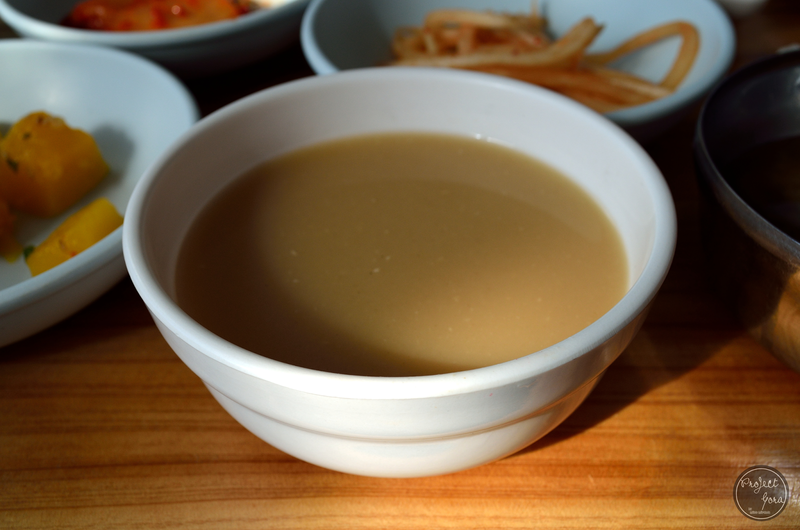 It was indeed an authentic Korean meal with lots of side dishes with free refills. The Ahjumma was delighted when she heard I love Kimchi so she gave me another plate. Annyeong Haseyo from San Mateo, Rizal! :) I arrived from South Korea about 5 hours ago. I am happy to be back in the Philippines, to see my dog, my parents and my friends. But leaving South Korea felt like an ending of something. 7 days of non-stop tour and adventure is really not enough! I am so glad to accomplish a lot of things in my bucket list which I will blog about in the next couple of weeks (hopefully). 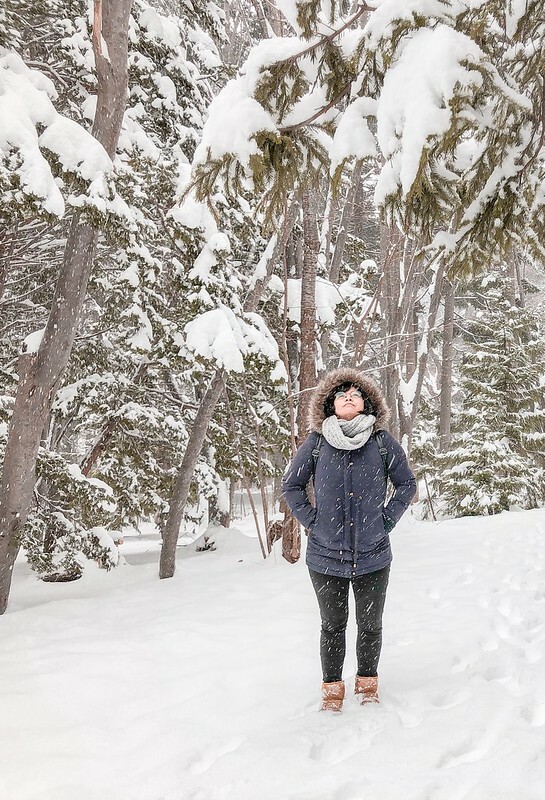 I still need to recover from too much walking, hypothermia and PSED (Post South Korea Escapade Depression lol). 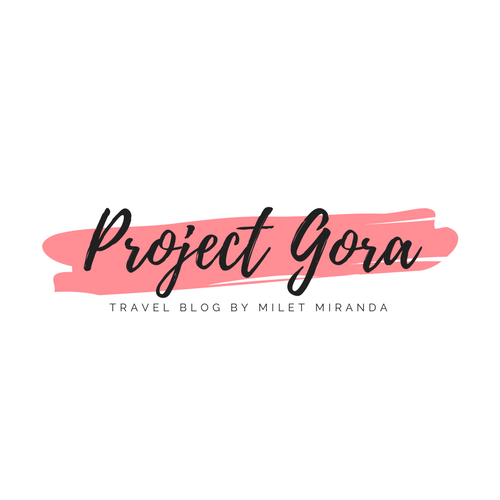 It was our second day in Cebu when we went to Oslob to see the gentle giants. Despite the very hectic schedule the previous day, I was up early at 4:00 in the morning. It was the highlight of our Cebu trip and I am not gonna let it pass me by. 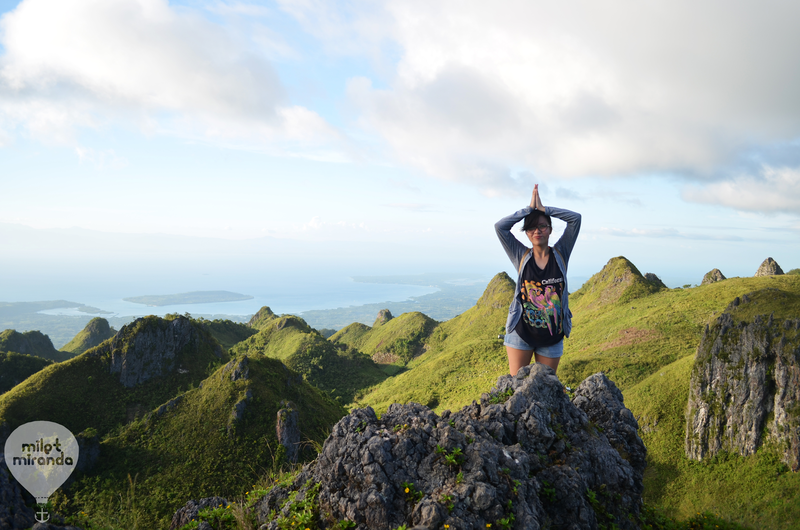 Another thing I was looking forward to is our climb up to the highest peak in Cebu, Osmena Peak. 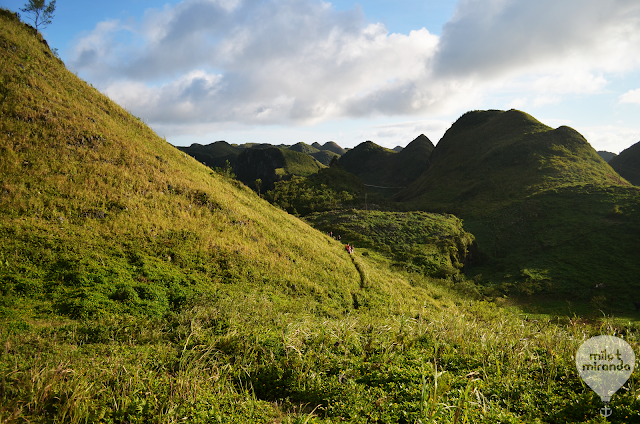 Though I am no mountaineer, when I saw photos online of this jagged and sharp hills that resemble the Chocolate Hills in Bohol, I promised myself I will go to the summit of Osmena Peak. The whale shark encounter ended at around 11:00 in the morning. After lunch, we headed back to Dalaguete. 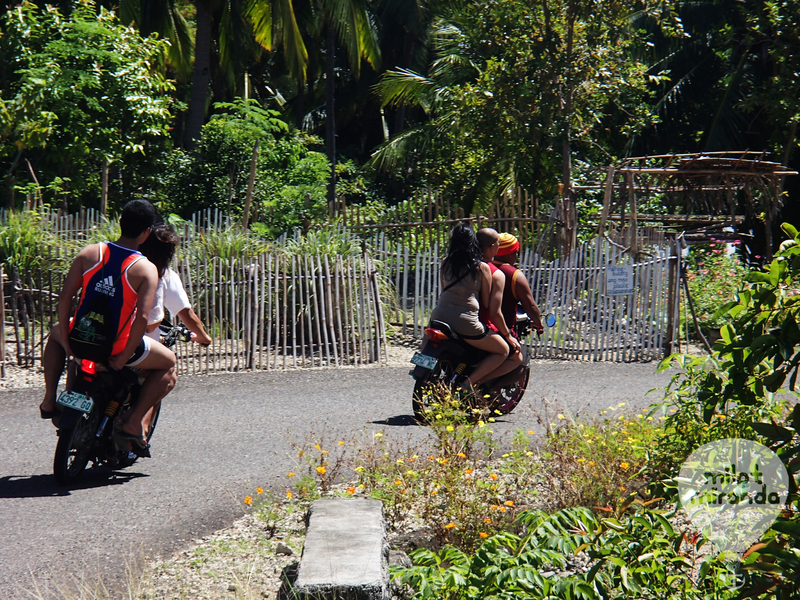 Because of time constraint, we decided to ride a habal-habal up to the final ascend point. No, that's just an excuse. Lol. 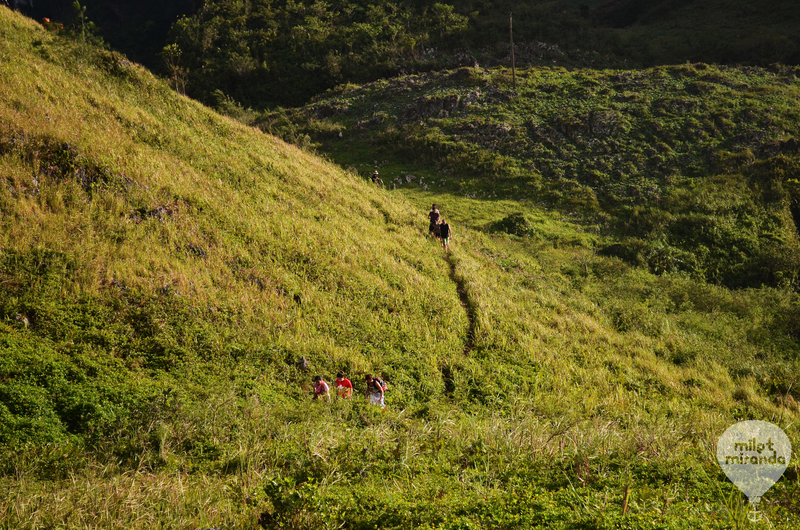 All of us do not have any experience in hiking or mountaineering so we ended up this route :) The usual entry point to Osmena Peak is the Mantalongon Market. 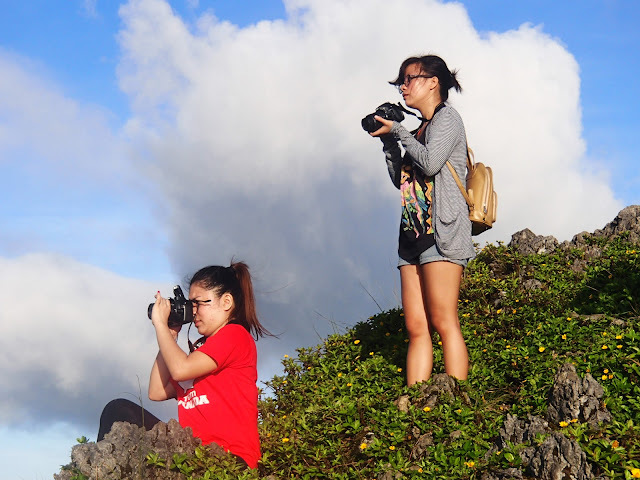 It took 45 minutes from Dalaguete town proper to reach Mantalongon Highlands. It was the longest habal-habal ride I had so far, and the most frightening (no doubt). Who would have thought, 6 people can ride a habal-habal all at the same time?! Though it scared the hell out of me, I can't help myself but marvel at the views. 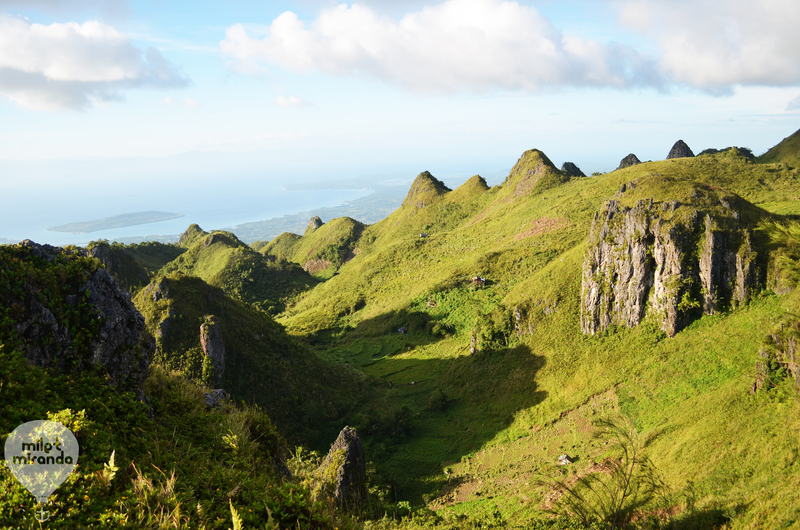 The view of Mantalongon Highlands is absolutely stunning! ang sabi ng pose ni japong! Hindi ko kinaya mag jump shot dito! - From Cebu City South Bus Terminal, take a bus heading to Oslob. Get off at Dalaguete town proper. Travel time is approximately 2 hours. - Local kids are the usual tour guide.